Preheat the oven to 300°. In a large ovenproof saucepan, combine the milk with the 2 cups of water and bring to a boil. Whisk in the grits and 1 teaspoon of salt and bring back to a boil, whisking constantly. Cover the grits with a tight-fitting lid and bake for 1 hour, or until the liquid is nearly absorbed and the grits are just tender; stir at least once with a wooden spoon while baking. Meanwhile, in a heatproof bowl, combine the dried porcini with the 3 cups of boiling water and let soak until the porcini are softened, about 15 minutes. Drain the porcini and reserve 2 cups of the soaking liquid. Finely chop the porcini mushrooms. In a large saucepan, heat 3 tablespoons of the olive oil. Add the carrot, onion, celery and garlic and cook over moderate heat until the vegetables are softened, about 8 minutes. Add the white mushrooms and the chopped porcini mushrooms and cook until the mushrooms begin to brown, about 8 minutes. Add the fennel seeds, peppercorns, bay leaves, parsley, tarragon and 2 of the thyme sprigs. Stir in the wine and sherry and cook over moderate heat until reduced to 1/2 cup, about 10 minutes. Add the reserved 2 cups of porcini soaking liquid and boil until reduced to 3/4 cup, about 15 minutes. Strain the sherry broth into a small saucepan, pressing hard on the solids with a ladle or wooden spoon. Whisk in 3 tablespoons of the butter. Season the sherry broth with salt and pepper. In a large, deep skillet, heat the remaining 2 tablespoons of olive oil. Add the fresh porcini mushrooms and the remaining 3 thyme sprigs and cook over moderately high heat until the mushrooms are golden brown, about 10 minutes. Season with salt and pepper. Return the grits to low heat and vigorously whisk in the remaining 5 tablespoons of butter and the Parmesan cheese. Stir in the chives, then season the grits with salt and pepper. Spoon the grits into warmed shallow bowls. 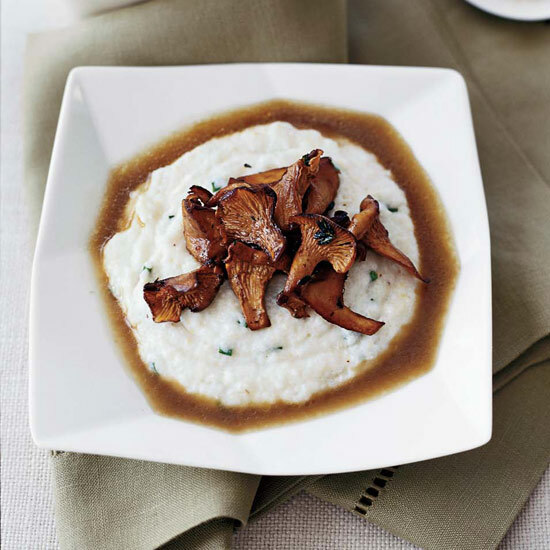 Top the grits with the sautéed porcini and spoon the sherry broth all around. The sautéed porcini and sherry broth can be refrigerated separately overnight. Gently reheat the porcini and the sherry broth separately. Douglas Keane prefers stone-ground grits from Anson Mills (ansonmills.com) because of their intense corn flavor.